If the desert camouflage exterior and the blowing with pride military flags don’t tip you off, then we will let you in on a Tucson Arizona treasure! 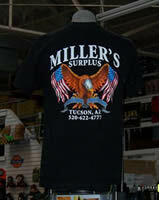 Millers Surplus has been serving downtown Tucson since 1951 at 406 North 6th Ave.
We specialize in hard-core outdoor lifestyle gear, be it military, casual campers and hunters or survivalist, Millers Surplus is the hookup. We have all the new military issue digital camouflage and also traditional vintage cammo, Rothco, Propper, Tru Spec are some of the brands, we have hundreds of knives and Camelbacks and all type of survival and safety gear. Camping enthusiasts will find quality Coleman products and accessories. Dutch Ovens by Lodge and MRE’s, Hats and Bandanas! Hundreds of items for camping and survival and outdoor lifestyle!